Chapter 1 is an insightful discussion about the A2/AD issue after Warsaw. Is there really no reason to panic regarding the Russian access-denial archipelago? Wales sent a message of a weak, nevertheless clear alarm – the Alliance refused to declare Russia an adversary, but considered it a threat. A lack of consensus among the 28 Allies continues to prevent a common perception of and approach to the relationship with Russia. 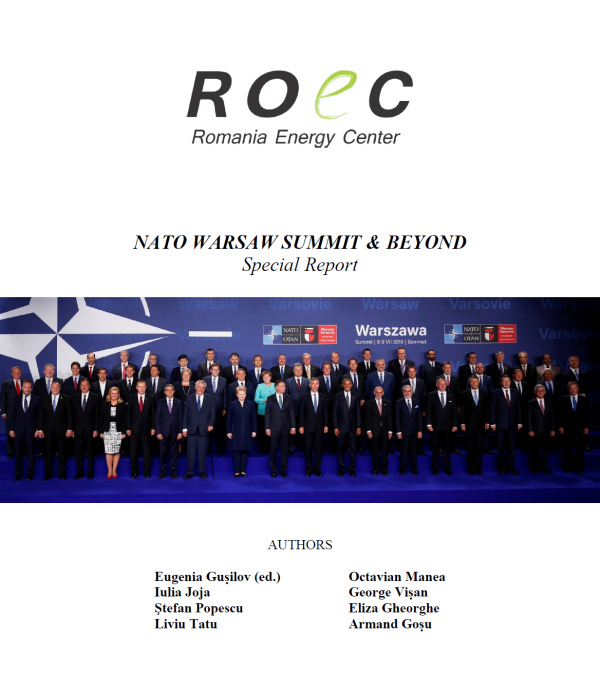 The chapter lays out all the thorny issues: diverging threat assessments within the Alliance, NATO’s “reinforcement trap”, Europe’s gaps in air and maritime forces, Bucharest’s very low ability to deter and what can be done to contribute more to maritime deterrence in the Black Sea. It takes stalk of the reassurance measures decided in Wales and in Warsaw and maps out some of the advances of Eastern European states in thickening up deterrence in the East. The authors take note of Romania’s learning curve in framing the security threats in the wider Black Sea area. Before 2015, Romanian officials were very skeptical about A2/AD and reluctant to acknowledge the very existence of the issue publicly. Today, Romania seems to officially join the club of those NATO Eastern Flank allies (like Poland and the Baltic states) profoundly concerned about the emerging of the A2/AD bubbles in their proximity. However, the problem Romania and the Alliance face with regard to the Russian threat in the Black Sea is creating and developing a yet altogether virtually inexistent deterrence, first by punishment, then by denial. The second part of the chapter explains the renewed Alliance focus on finding the next-wave deterrent technology and associated revolutionary operational construct. It offers an illuminating account of the second offset strategy: the context in which it appeared, its key architects, goals and battle test. The search for the 3rd offset strategy (currently underway) has its own architects, who access the past and its lessons in order to leverage the next wave of weapon-systems, to rethink and update operational constructs for an A2/AD environment. Chapter 2 focuses on the NATO ballistic missile defense in Europe. It provides context for understanding the reason for its existence, its initial design (and subsequent amendment), it discusses issues that are less known to the general public such as missile defense economics or gaps in Romanian air defense systems. By default, the protection of the missile base at Deveselu falls to the host nation, Romania. Therefore, awareness of how well or ill-equipped is Romania to deal with potential cruise missiles strikes or air strikes (their concentration in the Black Sea is not accidental) against missile defense assets deployed on Romania’s territory is key. As is the understanding of how Russia is hedging against the U.S. missile defense deployments in Europe. Furthermore, this chapter offers a rare perspective on perception of the missile defense project. Much like in the story with the elephant and the blind men, Europe’s BMD is viewed differently, based on different historical experiences and strategic cultures. The concept of ‘strategic defense’ itself is perceived as an extra-European (American) one, since Europe has considered up until now tactical missile defense only. There is the American view, then there is Europe’s fragmented vision (with France at one end of the spectrum, pushing for greater European strategic autonomy, and the Eastern European host nations, at the other end, who see the BMD as an additional layer of security, on top of Art 5 guarantees). Finally, there is the Russian perception who fears any upset of the global strategic balance (i.e. any increase in the U.S. technological advantage), even if the BMD does not affect Russia’s land-based, underwater or nuclear deterrent. Chapter 3 examines the role of nuclear weapons in NATO’s strategy. It has two distinct parts: one which looks at deterrence between the U.S. and Russia, the second one which looks at the reliability of the American nuclear umbrella over its junior allies in Eastern Europe. Since the crisis in Ukraine, both Russia and the U.S. have increased the profile and operations of their nuclear-capable forces. These two countries still hold over 90% of the nuclear warheads that exist in the world today (an estimated 15,000). What is yet more alarming, for the first time since the end of the Cold War, military exercises have included nuclear strike scenarios (Russia’s Zapad 2009 simulated the limited use of nuclear weapons). To make matters worse, Russia now admits a limited nuclear strike for de-escalation purposes: the so called ‘escalate to de-escalate’ policy. The role of the nuclear arsenal is no longer viewed as having mostly political value. These changes in Moscow’s and Washington’s nuclear posture spill into extended nuclear deterrence (END) territory. NATO is an alliance like no other – a nuclear alliance. But it is beset by two problems. First, Washington will have difficulty using END for anti-proliferation purposes, in other words, to keep its allies non-nuclear. The UK and France do not make their arsenals available for the kind of nuclear sharing schemes the U.S. has enforced since the Cold War, which leaves the U.S. in a unique position. Collective security commitments in nuclear alliances are meant to create the impression that all allies are created equal. Yet, geography and history quickly dispel such illusions. Every country tries to become the “special partner” and distinguish itself from other the protégés by hyping the threat, provoking the adversary, or playing the victim. This attention-seeking behavior poses the danger of dragging the patron, and ultimately the entire alliance, into an unwanted conflict. The ongoing one-upmanship between Romania and Poland presents NATO, and the United States, with a difficult circle to square: how to reassure two competing junior allies without causing further trouble with Russia. Chapter 4 focuses on Turkey, a pillar state for the security of both the Southern and Eastern Flanks of NATO. Turkey has been a valued member of the Alliance since the 1950s. It has the second largest standing military power in NATO and is the most important NATO regional power in the Black Sea and in the Middle East. The chapter looks at what Turkey means in NATO and employs an interdisciplinary approach (military, foreign affairs and economic perspective) to shed light on the elephant in the room: the consequences of the failed coup attempt and, in parallel, the 8 month hiatus in its relations with Russia, followed by the subsequent rapprochement. The shooting of the Russian jet brought a nadir in Turkish-Russian relations, an episode that was put to rest at the end of June by the official apologies of the Turkish president. However, the mid-July coup seems to have created a watershed moment in Turkish-Russian relations. Turkey’s political messaging to Russia since has been loud and unequivocal, and stands in contrast to messages sent to the West. What implication may this have on Turkey’s relations with its Western allies? Or, is this just rhetorical? NATO is a military alliance, but it also represents a community of shared values. Turkey’s latest authoritarian accents place it much closer to the Russian and Chinese models than to those of NATO member states. Recent events do raise a legitimate long-term question: what does the new normal of Russian-Turkish relations mean for NATO? Drawing a firm conclusion is premature, but it has become evident that Turkey wants more geopolitical optionality. Read the Full Report (72 pages) HERE.